The Tiger Inn in East Dean is offering runners who complete the full Beachy Head Marathon this year a free pint of beer from the Beachy Head Brewery on presentation of their medal. 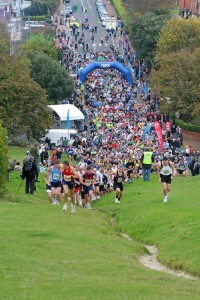 The Beachy Head Marathon, which this year takes place on Saturday 26 October, is one of the biggest off-road marathons in the UK. The race starts at 9.00 from Bedes School, Duke’s Drive at the western end of the seafront at the foot of the South Downs walking trail. The 26 mile route takes the 1750 runners across the stunning landscape and challenging terrain of the South Downs countryside, including 300 steps and 14 gates. Spectators will be able to watch from a variety of viewing points as the course covers the villages of Jevington, Alfriston and Litlington, plus Friston Forest, the Cuckmere Valley, Seven Sisters, Birling Gap and Beachy Head. New for this year is Beachy Head 10K, a brand new event aimed at those wishing to tackle the terrain over a shorter distance, which takes place in conjunction with the full marathon on the same day. The Tiger is ideally located for spectators to stop for a drink or something to eat. The pub even serves breakfast seven days a week to non-residents. It has a warm, welcoming atmosphere and serves delicious classic British dishes, plus a variety of drinks including beers from the award-winning Beachy Head Brewery.